← For Grace. A Taste of the Middle East. Orange and Almond Cake. Remember the tag line for Hoadley’s Violet Crumble – it’s the shatter that matters? Growing up I adored Violet Crumble – tooth achingly sweet honeycomb bars smothered in chocolate. After all these years, I’m still a fiercely loyal devotee, give me a Violet Crumble any day over a Crunchie Bar. Writing about those bees from Ribeauville, Alsace I began to reminisce about my childhood holidays spent fooling around the kitchen making honeycomb. Part science experiment, part culinary adventure this was one of my favourite kitchen pursuits. I recall being mesmerised by the theatre of how a mere two teaspoons of bicarbonate of soda added to hot toffee could create a heaving, overflowing mass of golden lava. It’s a pity that this enthusiasm didn’t extend to chemistry lessons in the school science lab. The secret to making golden honeycomb with a satisfying shatter is in the heating of the sugar syrup to the correct temperature. 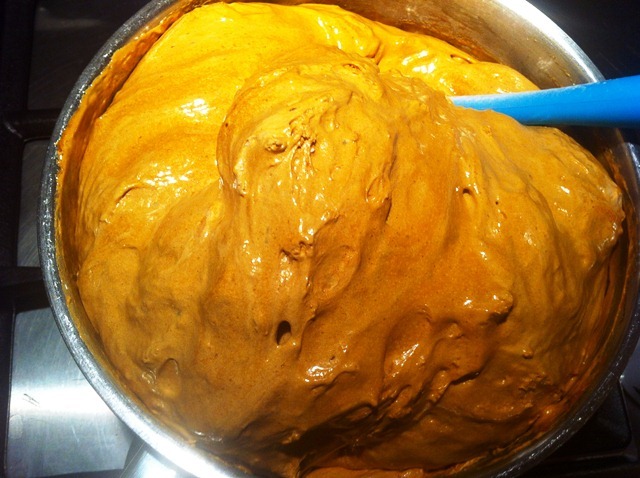 Honeycomb is essentially hot toffee blended with a little bicarbonate of soda to make it bubble and foam. The mistake most first timers make is to take the syrup off the heat too soon. This makes the honeycomb sticky and doesn’t allow it to set correctly. Whole volumes have been written about the science of candy making. All you need to know, however, is to make toffee the syrup needs to be heated to “hard crack” stage. This is about 150C on a candy thermometer, or you can use the old-fashioned drop of hot toffee in a glass test. Once the toffee cracks, its time to add the soda and brace for the mixture to bubble and foam. We didn’t own a candy thermometer when I was growing up. Part of the fun of making honeycomb was to test the consistency of the sugar syrup as it cooked. There was lots of dropping of toffee into glasses of water to see whether it would crack, and of course tasting our efforts along the way. Whoever said the journey isn’t as enjoyable as the destination, never tried their hand at toffee making. Thread (110C) forms a long thread that disperses easily when dropped in water. Hard Crack (150C) toffee will form brittle threads that easily break when removed from the water. Allow the bubbles to subside a little and immediately add the bicarbonate of soda to the mixture. Be sure to use a large enough saucepan as the mixture will more than double in size. Beat well as you add the bicarbonate of soda to make sure it is well combined, before tipping onto the prepared baking tray. Here’s a photo of the transformation of rich dark toffee into a golden, lava mass as you add the bicarbonate of soda. At one point I must admit I did fleetingly consider tinting the toffee mixture blue before adding the soda, as a nod to the bees from Ribeauville, Alsace. 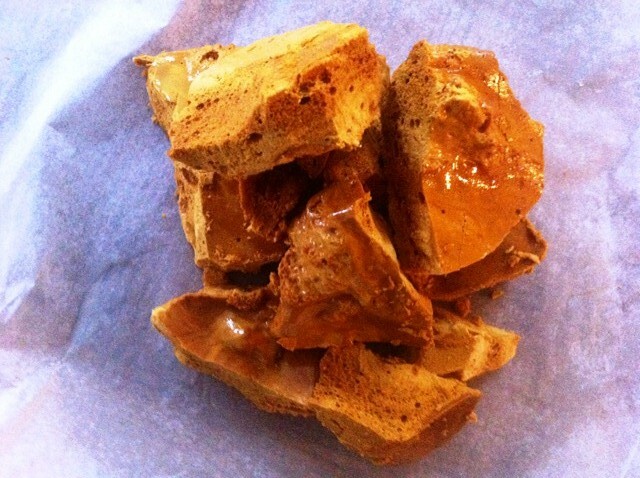 Perhaps I’ll coat the cooled honeycomb shards with melted dark chocolate to make my very own Violet Crumble. 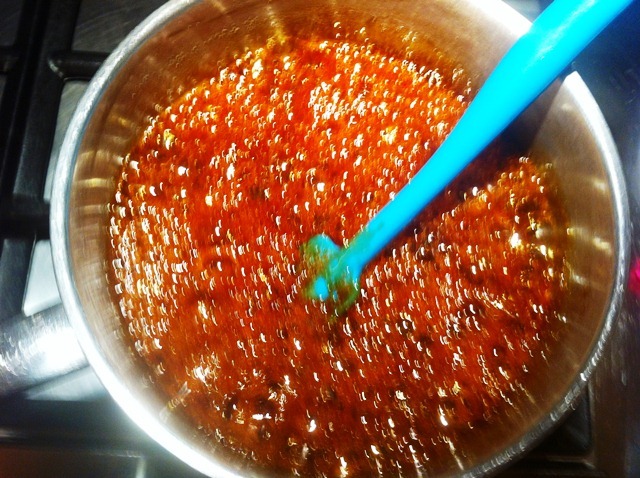 PLACE sugar, honey, golden syrup and water in a heavy based saucepan with high sides. STIR over low heat, until sugar dissolves, occasionally brushing down side of the saucepan with a pastry brush dipped in water to remove any sugar crystals, about 5 minutes. INCREASE heat to high and bring to the boil. Cook, without stirring, for 10-15 minutes or until the syrup reaches hard crack stage (150C). REMOVE from heat and set aside for a moment to allow bubbles to subside a little. ADD the bicarbonate of soda and quickly stir with a wooden spoon until combined. The mixture will bubble and foam. POUR onto the tray and set aside to cool completely. TURN out the honeycomb onto a clean surface. Break into large pieces. Store in an airtight container. This entry was posted in Confectionery, Sweet Treats, What I Love to Cook and tagged Confectionery, Food, Golden Syup, honey, honeycomb, Recipe, Sugar. Bookmark the permalink. 3 Responses to It’s The Shatter That Matters. Old-Fashioned Homemade Honey Comb.